You go to reach for a new garbage bag or the bottle of dishwashing detergent and see a puddle of water under your kitchen sink. You have two options, one is close the cabinet and pretend you didn’t see it or grab a towel and potentially fix your problem. What have you got to lose? A plumber is always a call away if you don’t feel up to the task. The first thing to check may seem a bit too Captain, but when you clear out all of the cleaning bottles, make sure it wasn’t just one of those leaking. 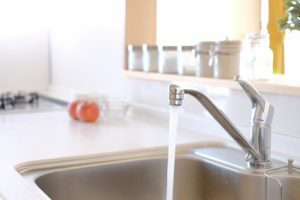 Once they are out of the way and the water wiped up, turn the faucet on for a few seconds and look for leaks. While it is uncomfortable to have half your body in the cabinet, you can use a folded up towel as padding on the corner ledge. Don’t forget to have extra towels nearby. The most reasonable method is to look directly up from where the water is sitting. You may be able to see where the water is dripping from. If you are having trouble finding where the leak is coming from, it may be the drain flange. Turn the water on and plug up one side of the sink at a time. If it leaks, you have your source. Once you have identified the source, it is okay to turn the water off at the valve (unless it is in fact the flange, there is no need to turn off water to replace that part). Open the faucet up to drain all of the excess water. If the leak is from a fitting, it may just need to be tightened with channel locks. The supply lines are pressurized and it is not uncommon for the pressure to cause their fittings to loosen. The seal directly under the faucet fixture can be replaced by removing the fixture. The same with the sprayer; it may just be a worn out seal. You may have a cracked rubber hose. Sprayers are sold in many stores and easy to replace. Repairing the trap is often more involved and if you are not comfortable with fitting pipes back together, it is best to call a plumber. If it is a blockage, an auger may need to be used. Or if your trap is metal, it could be severely corroded and need to be replaced.